If you’ve ever yearned to mine some buried treasure, you need to learn about the concept of dredging. 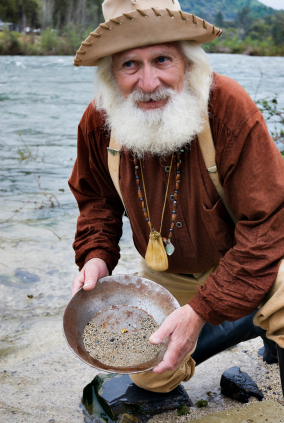 It’s considered the most effective method of recreational prospecting and it’s gaining in popularity. Simply put, dredging involves using a suction dredge to vacuum gravel from the bottom of a creek bed. For the most part, a dredge is a sluice box which is affixed to a four-legged stand or positioned on floats. An engine pump is then either mounted on the floats with the sluice box or positioned on shore. Water at high pressure flows from the pump through a hose to a jet tube or power jet nozzle. Thanks to the principle of suction, you are then able to bring in gravel, rocks, and gold. You should know that dredges are not one-size-fits-all — there are a variety of sizes from which to choose. You can select anything from a one-and-a-half-inch backpack dredge that can be easily moved to a remote location, or choose a version as large as 12 inches. The size of the dredge is determined by the diameter of the suction hose–not the nozzle. The suction nozzle is usually fashioned from steel and is generally the diameter of the suction hose. The opening of the nozzle is ordinarily ratcheted down with a restriction ring so that the opening is decreased by about one-half inch. As a result, there’s less chance that a rock will plug the hose up farther up. To give you some idea of the size of dredges, a three-inch hose size with a nozzle opening of two-and-a-half inches can be used in an area with a maximum dredge size restriction of two-and-a-half inches. As with other recreational prospecting equipment, you’ll find that dredges tend to vary in design. Gravel enters the sluice box either by means of a “Header Box” that slows the passage of water or by a “Jet Flare”, a long flaring tube that accomplishes the same feat. For many years, the Header Box has been the mechanism of choice, but the Jet Flare dredge is gaining in popularity because it offers more suction at the nozzle. In some cases, as with smaller dredges, inner tubes are used as floats. In contrast, most dredges utilize plastic pontoons which can be collapsed when transported. For shallow water, dredges that are high banker-dredge combinations are used. These possess a four-legged frame which holds the sluice box. Larger dredges which are three inches or greater may have a breathing air pump positioned on the engine-pump to carry compressed air to the dredger, who can then go underwater to obtain gravel that is not otherwise accessible. This feature is significant because the bottom of a riverbed may be characterized by cracks in the bedrock that has gold trapped inside. Prospectors consider dredges to be an efficient piece of machinery tailor-made to suit your needs. For beginners, experts recommend a two-and-a-half to three-inch dredge high banker combination. Such a rig is considered to be versatile and efficient and can be counted on to unearth a great deal of gold. But if you are already a seasoned prospector, experts suggest obtaining the largest dredge you can afford. Still, you must recognize the fact that you will have to operate under certain state laws. In Washington state, for instance, recreational prospecting is limited to four inches. Consult your local prospecting club for details about state size restrictions, and happy mining! Nice informative site! I’m relatively new to prospecting (just joined GPAA) so I found your “nuggets” very useful…good job and I hope to see more posts! Hi Jerry – just found your site. Ya know – dredges are illegal now in California – even the little itty bitty ones. Too bad – about the only way you can get onto government land that isn’t a fee park any more is to have a VERY long hose on your dredge and REACH over the “no trespassing” signs. From what I heard along the grapevine is that it’s because someone is building a Casino and didn’t want dirt in the water for their customers. There are groups opposing the law, but as far as I can see this state wants people caged. I’m just here visiting relatives and it would be a cold day in hell before I ever moved to a place the Gov has seized all open land. Holy cow. Anyhow, I’ll be reading your blog from NV pretty soon, LOL. Enjoying this site – stop by my place sometime and jaw with the rest of us hounds – you have the URL. Would love to talk with ya more. « Why hunt for gold?